G'day mates, I am really having some fun here in Oz. After leaving Maggie I went and visited Coppa, Cody, Rosie and Nicky. 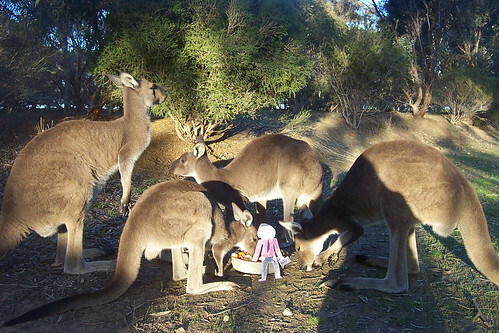 They are the best bunch of kangaroos I have ever met! They live with Debbie, who is a member of the Wildlife Welfare organisation. I got to share some tucker with them. These guys are so soft! I got to snuggle up to Rosie. Fair dinkum. I am leaning on Rosie (female) then to the left is Coppa (male), Cody(male) is on the right at the back and in front to my right is Nicky (male). Debbie met up with these fellas when they were babies and their mothers had been killed. Debbie raised them to be the best Australians you could ever meet. It's a good job those carnivourous roos didn't eat stanley!!!! Ohhh, I was very safe. 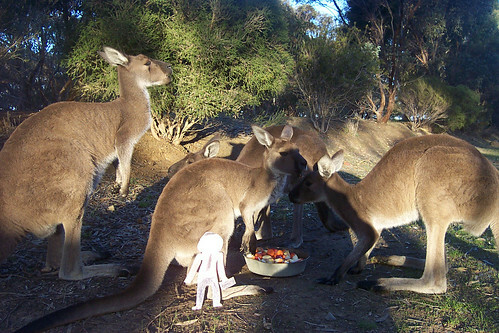 Kangaroos don't eat meat at all.